Learn the Kettlebell Clean and Press! The kettlebell clean and press is great because it teaches your whole body to work as a single unit. Your legs, back, core, and arms all benefit from this exercise. This exercise is adopted from the barbell clean and press of weight training. It's an old movement, but an effective one. Start the kettlebell clean and press from almost the same squatting, low hip position that you start the kettlebell swing from. Grasp the kettlebell as shown in the picture below. 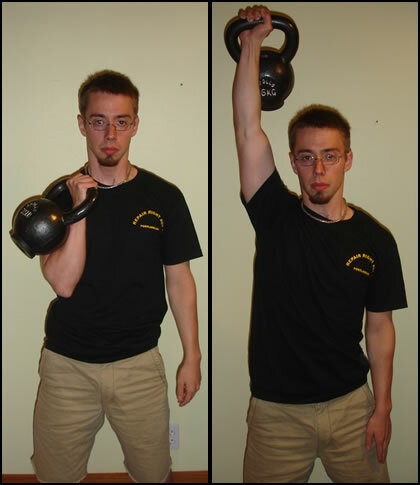 Then in one fluid movement stand up and swing the kettlebell up to your shoulder. Keep the kettlebell close to your body as you do this. It should have a close feel, with a snap at the end when you flip it around to the outside of your forearm. If it's far from your body, there will be impact on your forearm when you flip it around - NOT GOOD! Now you've got your forearm nice and snug against the trunk of your body. The kettlebell is hanging against the outside of your arm. In one movement, explosively press the kettlebell straight up into the air from your shoulder. That's the 'press' part of the kettlebell clean and press. Once you've got the kettlebell up into the air, lower it back and pause when it touches your body at you shoulder. Then, drop it between your feet on the ground & begin again. Since you're doing explosive movements, stay in a slightly relaxed state of tension. Not limp-noodle relaxed, but full of energy and able to do the movements in a flowing manner. NOT in a strained, slow, struggling manner. Be especially careful with your shoulder - if you've had shoulder problems in the past, this lift probably isn't for you. Keep your shoulder seated down in its socket. When you press the kettlebell your shoulders should be almost equal height. DON'T stretch your shoulder up, like you're in class at school and really want the teacher to call on you. If you lose control of the kettlebell, just let it fall to the ground. You can get hurt trying to catch it, and the iron lump has the right of way. Let it fall, then just pick it up and start over. Once you've got the hang of both the clean and the kettlebell press, doing them together is a great combination. It builds lower body and upper body explosive strength - try it out and add it to your kettlebell workout! • Click HERE to leave 'Learn the Kettlebell Clean and Press' & go back to the Complete Strength Training Home-page!